Lavanduloides is one of those salvias which have a similar name to another, lavandulifolia, and I often have to think it out slowly to get it right. 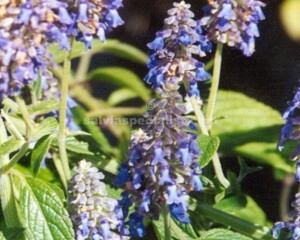 Lavanduloides is similar to ‘Agnes’ but has brighter blue flowers in winter. It has evergreen foliage and grows about 1m. It is a bit frost tender. I don’t find it long living in the garden but I really think I haven’t given it a good chance. Probably doesn’t like overcrowding! It can be multiplied by cuttings.